Versace for H&M finally made it, After what seemed like a rubber band ball of dates that left many shoppers scratching their heads for weeks. The one very big piece of information that didn’t fall short of misleading, was the clear protocol implemented by the retailer in what was known as “How to Shop”. NorthPark Center shoppers all new the shopping would begin at 8am, so in typical H&M shopping style, the lines were formed. A source at the retailer filled me in on the ever-changing head count that was around 1,000 plus people by 8am. 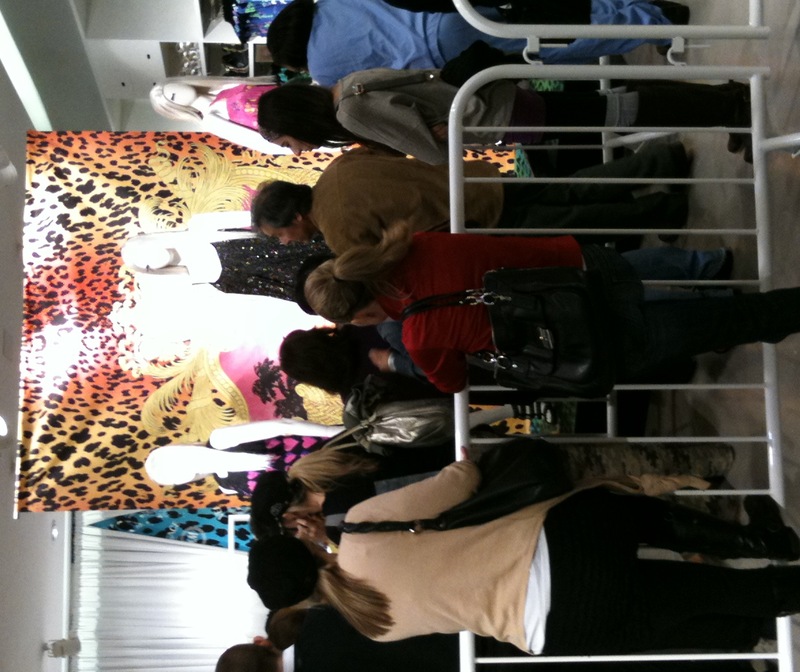 Although regulations and precautions were being made, that would , in hopes, not interfere with the non Versace Shoppers, only the Women’s collection was monitored, Leaving the men’s collection fully exposed to the ravaging pre holiday shoppers “with taste”. After the mix up of dates, I figured I would not take part in the madness and wait till noon. Entering the store’s make shift Versace Boutique made me almost regret the fact I didn’t wake up with the rest of the Versace congregation to pay my respect. My sinful action is apparent due impart that I left empty-handed. 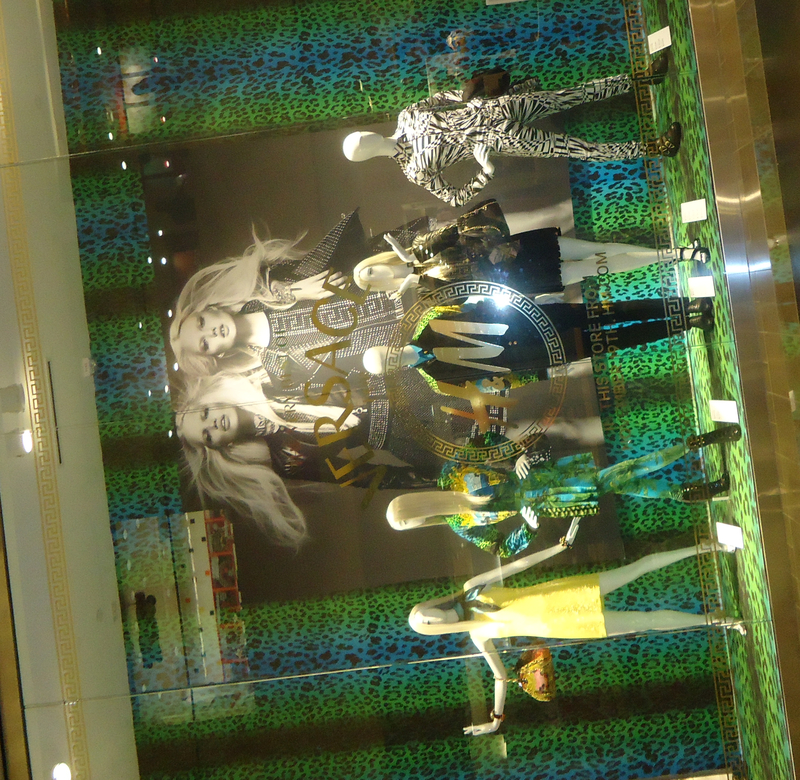 The opulence of Versace visuals were cut short, due to its focal point visual which was not a Medusa or Jungle Print product , but rather a large Sign depicting the Color Coded System that shoppers were ment to abide by. I must say, I felt like I was at the D.M.V, only with alot more color. Each color coded bracelet had a corresponding shopping time that was assigned, but none the less, it seemed the system worked, given the store was filled with chaotic silence and whispers of chic girls waiting in line asking themselves what was left. I must add one thing, among all these rules, and the amazing store transformation of H&M that now is the essence of Palazzo Versace, the barricades that blocked off the Versace section and kept the line in order, was a tad over kill, hasnt H&M herd of a Velvet rope, im sure AMC Theater would have lent a couple, but non the less the System worked, and it was pleasurable shopping. As for the Collection, well its everything it was made out to be, the Historic Heritage of Versace is Alive and well in the product line. 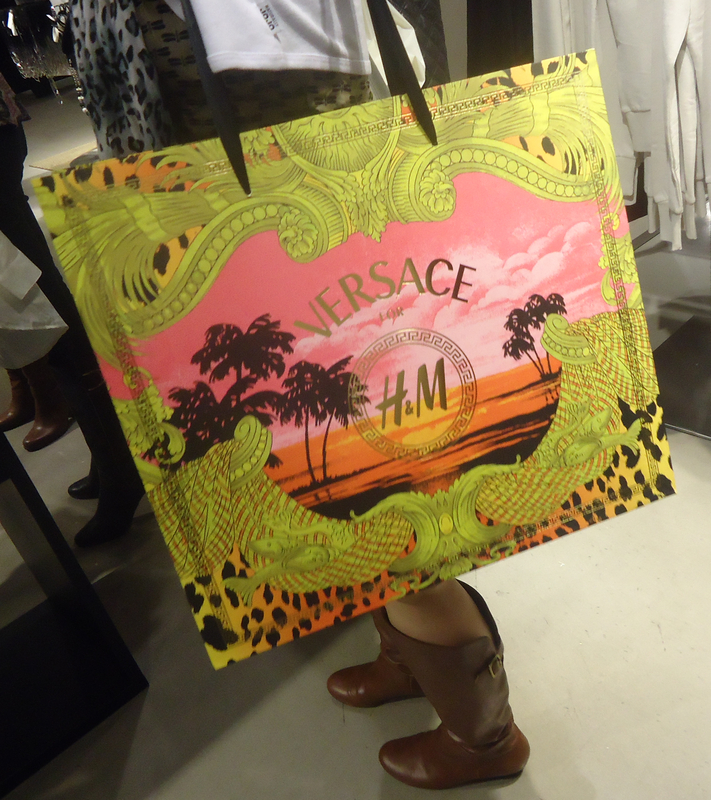 Even the Miami inspired Gold Baroque shopping bags are a killer. DFW sidewalk chic is going to reek of Christmas in South Beach, all I can say is “How Fab”….Viva La Donatella! Another H&M soruce gave me another bit of info, that seems to be more than just a rumor. The Collection is already due for a replenishment come the 21st, so there is still hope in snagging something, Happy Shopping! This entry was posted in | and tagged black friday, cheap Chic, chic, christmas shopping, DALLAS, DFW, fashion, gianni versace, H&M, H&M H, holiday shopping, Holidays 2011, milan, NorthPark Center, Palazzo Versace, Versace, versace for H&M. Bookmark the permalink.